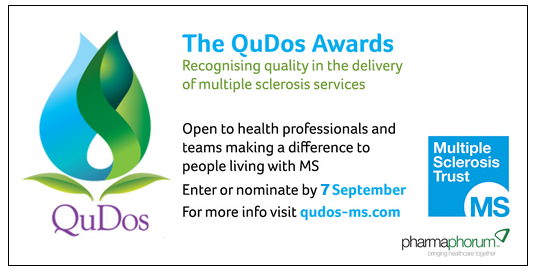 current page Calling all MS health professionals: enter or nominate colleagues for the 2015 QuDos in MS awards! Calling all MS health professionals: enter or nominate colleagues for the 2015 QuDos in MS awards! There are just six weeks left to enter and make your nominations for the first ever QuDos in MS awards – the awards that highlight innovation and excellence in MS services. We’re looking to celebrate the work of the MS health professionals that have delivered outstanding, innovative care for people affected by MS. This means MS specialist nurses, allied health professionals (such as physiotherapists and occupational therapists), neurologists and multidisciplinary teams – but also any health professionals that work with or deliver services for people with MS, including GPs, pharmacists and commissioners. The deadline for nominations is 7 September. To see the full list of categories and how to enter visit qudos-ms.com. Winners will be announced at a special ceremony on 7 November at the Beaumont Estate, Windsor.